are you missing? write me! Have a look at the statistics for the whole Team42! 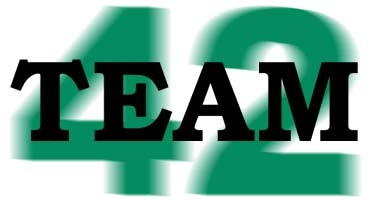 Hi and welcome to Team42's homepage! ``What is this Team42 and what the hell is it doing on my screen?'' you might be asking yourself right now. Team42's members come from irc channel #blafasel (irc server irc.blafasel.de) and most of them live in or nearby munich, germany. We are trying to beat the RC5-56 RSA Secret-Key Challenge. This means that we will have to find the correct key from 2^56 choices. As this is nearly impossible for a small group like us, we are donating our CPU power to the Cyberian RC5-56 project. We've all got spare cpu-time, let's try to do something usefull with it. We were quite a large and fast-growing team (at the end we were on rank 47 in the most calculated blocks list and stayed constantly in the top 10 of the currently fastest teams list. Have a look at an average statistic (from October 7, 00:40)! The RC5-56 challenge is now over - and we had a lot of fun. On GMT October 19, 1997, the key was found by Peter Stuer donating his cpu-power to the distributed.net (Bovine) team. Congratulations! Confirmed by RSA Labs, the key 0x532B744CC20999 presented us with the plaintext message: It's time to move to a longer key length.